In 1814, Abraham Colles first described the characteristic "silver fork deformity." 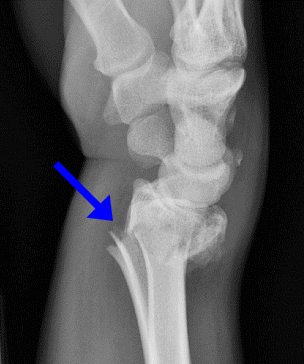 This injury is defined as a distal radius fracture with dorsal angulation. There is often associated fracture of the ulnar styloid process, which suggests injury to the triangular fibrocartilage complex, the ulnar continuation of the distal radius which presents a concave surface for articulation with the lunate and triquetrium. Distal radial fractures account for approximately 15% of all fractures treated in the ED, with Colles fractures being the most common wrist fractures in adults.